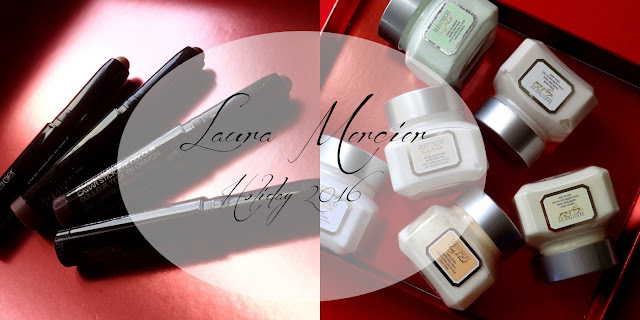 Laura Mercier does some of the best holiday makeup & body care collections each year. This year I’ve been loving the Layer Up Caviar Stick Collection ($38; lauramercier.com) and the Le Petite Souffles Body Cream Collection ($62; lauramercier.com). The Caviar Sticks in this kit are a deluxe sizes and includes an excuisve shade, Aubergine, a matte eggplant. That, along with some of my other favorites, Amethyst, Rose Gold and Tuxedo are included too. I love these convinient cream shadow sticks - I almost, always reach for them for a quick wash of color. Its a fabulous set and I found the quality of the Cavar Sticks to be the same as the full sizes. The Le Petite Souffle Body Creams in this kit are deluxe size pots of the luxurious body moisturizer in gourmand scents. Its a beautiful little set and a nice way to try out some of Laura Mercier’s body care products which are some of my favorites. They are rich, moisturizing and double up as great smelling hand creams too. Plus, the packaging is adorable! If you are looking for some great holiday sets, do check these makeup and body care from Laura Mercier’s Holiday lineup! They make for fabulous gifts to any beauty lover or just for yourself!